Julian Casablancas is back with The Voidz and the world is a better, more riotous place because of it. 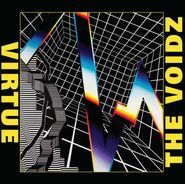 Their latest album, Virtue, is an eclectic, genre-straddling romp into all kinds of raucous musical energy. There’s autotune! (OK, only a bit.) Post-punk synths! Grit and grime! Snarling guitars! It’s like the best of all the post-Beatles rock subgenres got thrown into a blender and came out as this super entertaining jaunt into the heart of rock ’n’ roll darkness. Well done, boys.